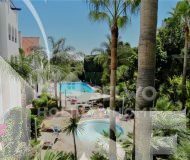 This newly furnished apartment is just a few minutes walk from the port of Estepona. 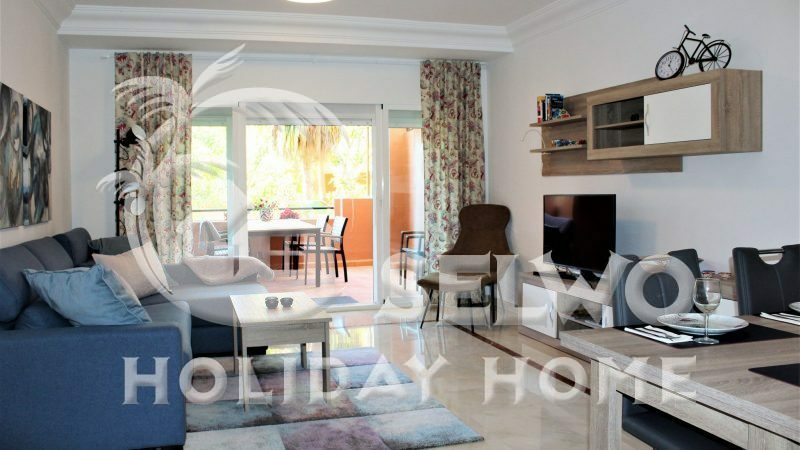 The apartment is extremely tastefully furnished and the kitchen is fully equipped for a complete holiday. The apartment consists of two bedrooms, (one with a double bed and one with two single beds). In addition, there are two bathrooms and a spacious living room with dining area. The sofa in the living room is a sofa bed measuring 130x190cm. From the large bedroom and / or the living room you have access to the terrace. The terrace of 25 sqm has a relax area and a dining area with views over the pool and the beautifully planned garden. A short walk from the apartment is the old town of Estepona. Amazing flower-filled alleys and colorful pots, small shops, cozy tapas bars, cafes and restaurants that provide a welcoming feel, a feeling of just wanting more of everything. No wonder Estepona is on everyone’s lips and is now called the Costa del Sol’s garden. Taking a walk in the old town every day is like a balm for the soul! For the golf enthusiast there are a number of golf courses around Estepona. The nearest is Valle Romano, only a few km away. Down in the harbor there are a large number of restaurants and cafés / bars and also do not miss the harbor’s Sunday market.